You've done it, you've planned, created and edited 2 months worth of social media content ready to ship! That's the easy part, the hard part is figuring out where to schedule them in order to receive the most impressions & engagement. I mean... What's the point of creating quality content if know-one is around to see it, right? 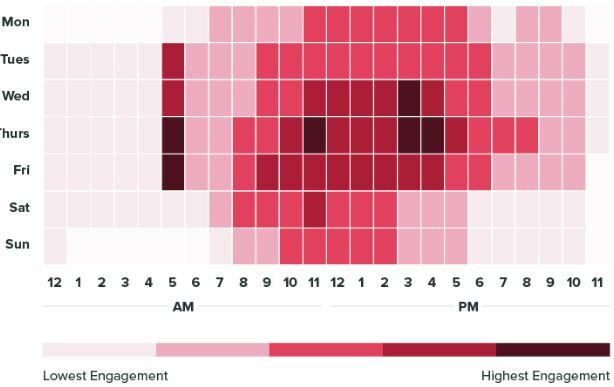 One thing to keep track of in the social world is finding the best optimal times to post as these tend to change frequently, probably because we have such busy lives, but still, you don't want to be left behind. Luckily, the good folks at Sprout Social have done the hard work for us and figured out (at least for now) what the current and most optimal times are to post. The best times to post to Facebook is Wednesday between 12 pm - 2 pm and Thursday between 1 pm - 2 pm. The least performing days of the week is Saturdays and Sundays. What Marketers should know: Ages 25 - 34 is the most common age range for Facebook users at 29.7%. The best times to post to Twitter is Friday between 9am-10am. The least performing days of the week are Mondays and Sundays. What Marketers should know: Ages 18 - 29 is the most common age range for Twitter users at 37%. The best times to post to Instagram is Wednesday at 3 pm. Thursday at 5 am, 11 am and between 3 pm - 4 pm. Finally, on Friday at 5 am. The least performing day of the week is Sunday. What Marketers should know: Ages 18 - 29 is the most common age range for Instagram users at 59%. 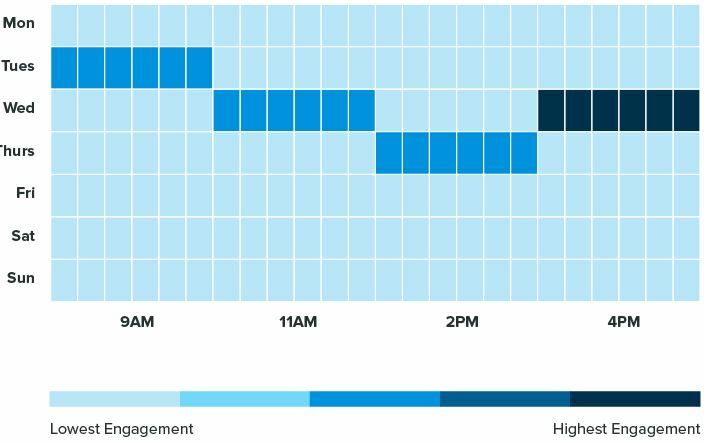 The best times to post to LinkedIn is Wednesday between 3 pm - 5 pm. The least performing day of the week is Monday, Friday, Saturday and Sunday. What Marketers should know: 13% of Millennials ages 15 - 35 use LinkedIn and there are over 40 million students and recent graduates that use LinkedIn. Let's take a step back and ask ourselves what we have learned. 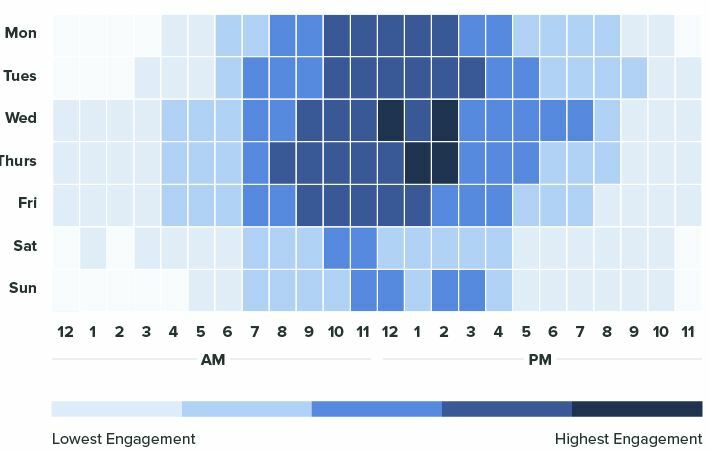 The weekend is the least optimal time to post receiving little to no engagement. Guess everyone is out shopping? 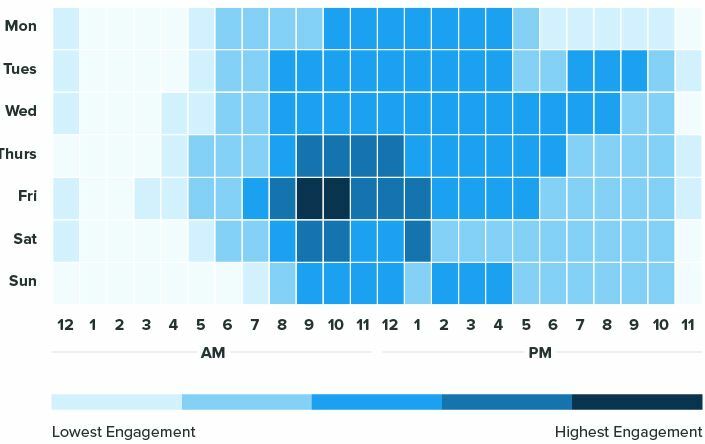 Generally, weekdays between 11 am - 3 pm will see the most engagement.